The Danish Pioneers magazine was published for the Sustainia Living event in February 2017. It features interviews with 10 leaders building a competitive, sustainable Denmark, and articles on the disruptors of tomorrow’s markets working with the Sustainable Development Goals (SDGs). The publication aimed to make the SDGs more relatable to citizens, and ultimately accelerate progress towards them. The SDGs lay out how to overcome some of the greatest challenges we face, but they can be difficult to engage in. We are faced with the challenge of how to involve people in fulfilling the SDGs by making the goals relatable. In a way, this is the world’s most urgent and critical communication venture. The Danish Pioneers publication showcased leaders contributing in someway to more sustainable ways of living and contributing to the SDGs. This, together with the Sustainia Living event, aimed to inspire action amongst citizens in their everyday lives, creating a movement that will spread, not only in Denmark, but worldwide. Danish Pioneers was published at the launch of Sustainia Living, for which the 1,500+ tickets sold out quickly. 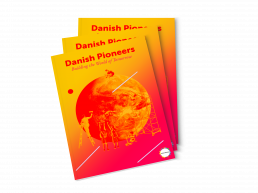 The Danish Pioneers publication was produced in collaboration with the partners for the Sustainia Living event. The founding partners were The Royal Danish Academy of Fine Arts, Fashion 4 Development, and Realdania.